In an article published this week, New York Times spotlighted East Village – UE’s new home and the center of arts and technological innovation in San Diego. Author Lauren Herstik highlighted the various development projects happening throughout the area, including the six blocks of mixed-use development known as Makers Quarter. While the landscape of East Village is transforming with new high-rise residences, office spaces, and creative venues, the neighborhood is still characterized by the old factories and warehouses that harken back to the early 1900s. One of these buildings is Underground Elephant’s headquarters, melding innovation and history under one roof. To read more about the evolution of East Village and the vibrant projects planned for the area, click here for the rest of the New York Times article. 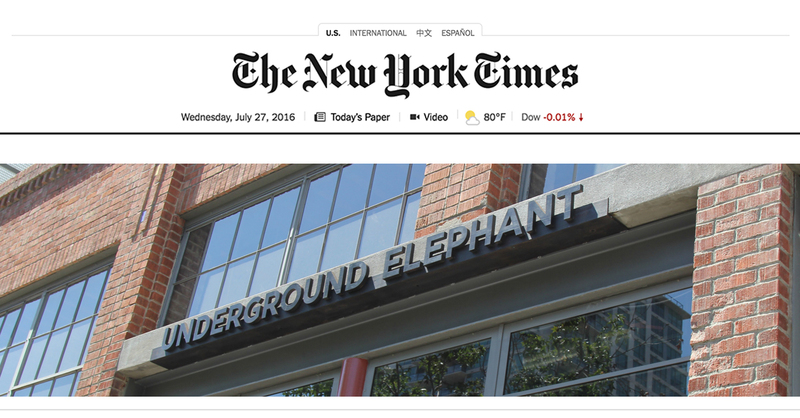 Excited to see what’s in store for Underground Elephant and their new home. Looks like you guys have a lot planned up your sleeve. “Melding history and innovation under one roof” sounds pretty cool, great word play Ellis! The beer garden sounded fascinating and I didn’t exactly know how that was a thing! Haha, nevertheless, I enjoyed the article.